The array of new digital technologies that we are trying to connect organizations into, for the world of digital insights, is going to be highly disruptive or empowering, for all organizations. It has the potential to radically alter our organizations performance. These are powerful technical forces that are going to connect the digital age inside organizations, these will require a deep thinking through for all the ‘points of impact’ this will have. Digital is presently moving way ahead for the systems our organizations have presently in place. What does need changing to ultimately yield the innovation returns we will be looking for? Expectations and reality needs resetting, the hard work is not ‘just’ in connecting the technology, it is its impact that it will have across the organization to be able to ‘react, respond and reorganize’ in very different ways from today’s practices. We are dealing with a completely different set of mindsets, skills, procedures, governance, processes and responsibilities. To gain from the digital evolution taking place we need a robust, comprehensive and radical overhaul of much of what is going on within our organizations. The innovation system is not broken (yet) but it is totally inadequate in its present form to capitalise on this influx of new opportunities digital connecting can bring. It will potentially just choke up and come to a grinding halt unless we seriously step back and re-evaluate the innovation process, its needs, tools, frameworks and its ‘new way of working’. We need to redraw the innovation system and its management structure, procedures and governance. There is this need to blend technology post digital with people in significantly different ways. Innovation calls for better automation and its management understanding to design all these into its system. Information systems and their data outputs might generate but humans have to frame the challenges and problems they are in search of answers. So how can digital technology be leveraged more effectively as an engine for innovation and future growth when we are seeing current innovation constraints and impediments? Is the innovation process fit for the new purpose? Clearly not. It needs a radical overhaul to support the digital technologies and the ‘insights’ coming towards it. 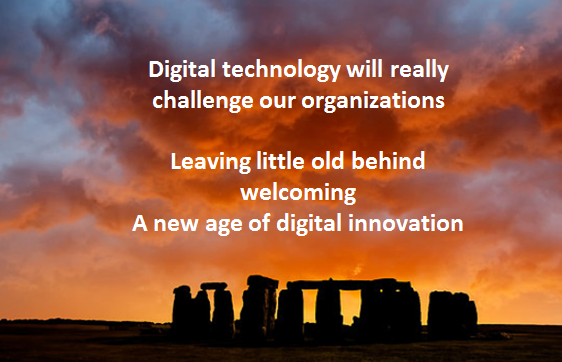 To embrace digital innovation there is a lot to work through, here is my initial attempt. As we move towards this age of digital innovation, what do we face? “We are faced with a truly pervasive global network making more things possible, the biggest value proposition of technology has shifted to the new, deeply super-connected, scalable-to-billions, always-on ways of working that digital business now represents. The upshot: Nearly everyone today is connected to everyone else in the world 24/7, with the devices in their pockets and purses” (View of Dion Hinchcliffe in his article “The internet inside the Enterprise“). Innovation needs to race to catch up and respond, so as to capitalize on it. Equally in Dion Hinchcliffe’s view, which I can recognize: “the Internet has proven itself countless times as that uber laboratory of innovation, trying — quite literally — millions of new ideas in scale, continuously finding the way forward on how best to create value over networks, sustain it, and to relentlessly find new models that have the least friction, cost, the highest velocity, most agility, and best ability to tap into shared innovation.” These observations point towards a very different design and structure within organizations to achieve these ideas to scale. What will be the new management skills and leadership competencies required to achieve continuous innovation and transformation within organizations? What will need to change, what needs to be brought in and equally, thrown away from today’s practices? What are the new forms of organizational design that will be required as ‘adequate’ for an environment of unremitting change? The present innovation system is not ‘fit for digital innovation purpose’ today. To learn to apply the application of technology in support of the business, to cope with the new mantra of making it ‘cheaper, faster, and better‘, combined with the increasingly need to ‘communicate, collaborate, and engage‘ across businesses, customers and stakeholders 24/7, we will need very different, more agile and adaptive systems. Everything about technology is poised to upended the current model in organizations, from architecture, software development, processes, the way to manage and offer a very different level of service delivery in new business models, rates of change, and cooperation and co-creation needs. The worry of dealing with increasing risk; cyber risk, organization risk and the organizations ability to capitalize on any discovered insights before others do, all raise the risks and threats. Boards just have a real aversion to risk and how this will play out as we digitally connect will partly determine the winners and losers due to their risk appetite. To help ‘modify’ the risk concerns at board level, the CTO, CIO or CDO or all three, need to stop talking about the potential of these technologies and more the language of business. Frame this not in terms of cost or disruption but in revenue and new organizational opportunity. The need is to establish a digital strategy, which represents all the opinions and the fusion of business and IT, as they are becoming one of the same, as digital is becoming a unifying concept and pervasive and all business has an increasing digital element. There is this need for cognitive alignment as it will be increasingly about sense-making, learning, understanding pattern recognitions, gaining debate, consensus for alignment within the leadership teams. We certainly need a very different organization design to digitally innovate? The radical shift for the innovator is the need to define the right challenges, in constructing the digital brief, in building the parameters and inputs to be able to ‘extract’ the data that leads to information and knowledge that eventually connects to final valuable insight. Today we are not so good at that. The human part within the new innovation process will still be the framers of the task, interpreters of the information and synthesizers of the result. They will be guided by the digital knowledge and techniques they deploy to help them in this. Framing and synthesizing becomes an essential skill. Developing those abilities and skills in interpreting and synthesizing the data and insights will become essential attributes so to attain the understanding to deliver those “higher scale of richer, more innovative insights” expected . The ‘crunching’ of large data sets, will this be simply be left to the analytic person? Someone deploying different techniques, algorithms and predictive solutions. Will they have the necessary understanding or business experience? Who will have oversight or determine interpretation? Much will rest on the way these new insights can be communicated back into the organization, to be translated and to be turned into new profitable innovation offerings. This ability to align analytics, extract important insights and spot the potential commercial value will become critical. These have the potential to determine the organizations future. There is this need to spot more of those ‘weak signals’ to learn from, using predictive and pattern recognition tools and methods, generating ideas or insights that fit within briefs or parameters that align to the organizations strategic needs. What value judgements will be constructed to rank and grade ideas or insights, so as to begin to formulate the commercial response in new innovation activities. Trending, producing insights, scenarios and patterns of discovery, will need both computer and human power of understanding. Forecasting potential, spotting the breaking needs, segmenting the markets and validating assumptions and trigger points for solutions will become a pivotal role. Listening, filtering, constructing user-experiences that allow interactions and knowledge sharing will be essential. It will be again the analytics, the discovery process and the event management techniques will partly determine the value and richness of these engagements. What about the need to build new capabilities? There is this increasing need to develop sense-and-response capabilities, increasing ambiguity and uncertainty over time will change our ICT thinking. There will be increased demand for visualization and managing decisions in responsive, agile and adroit ways. Constantly communicating the ‘breaking’ story will be essential. The increasing value of purpose-designed intelligent dashboards to allow decision-making and the appropriate information to flow to the decision maker, as well as the governance trail of where, when and who made what decision becomes important. Whole areas of research, testing, experimentation, modelling will become increasingly automated but the framing parameters will again require growing specialisation and understanding. The ability to test combinations, to work through countless data points will generate new possibilities but these again need clearly framing well, so as to avoid drowning in data, ‘for the sake of it’. The ability to engage in and across different communities will allow for richer understanding. These communities will be internal, business partner ones, customer and other stakeholder communities all contributing and engaging. The emotions, feeling and often unexplained human behaviour will always intervene somehow. It will depend on the robustness and strength and belief in automation on personal as well as organizational levels. This needs careful managing the engagement. Lastly, and I think most important, you do have to keep asking that question of “what are you trying to do, resolve and understand” because data for data’s sake will just simply just let you drown in it, equally change for change sake. We need to begin to really think though this as a complete redesign. There are a host more areas to draw out in any digital innovation system we do need to surface and resolve. To achieve that new position of understanding is a really hard piece of work required to determine and redesign the new digital innovation process. It cannot be a simple ‘bolt-on’ job, it needs a radical redesign. We should grab this ‘moment of time’ to think what a new innovation system, fit for the post-digital age really should look and operate like. Organizations will be in their search for understanding what needs to change within their innovation systems as soon as they realize that today’s design can’t cope. What is needed depends on how each wants to ’embrace’ digital. It will need a real depth of understanding and working through. I’m on it, are you? Its BIG and breathing down your neck. Welcome to the age of digital innovation. *** This is the final part of a seven part exploratory ‘open thinking’ about digital technology and its potential impact on innovation as we know it today. These have been published daily over the last week.